If you have questions about the Cardinal Chorale, please consult this list. If there are other issues we have not addressed, please contact us and we will be happy to assist you. Who can participate in the Cardinal Chorale? The Chorale is open to singers who have completed the 9th grade through the first year of college. 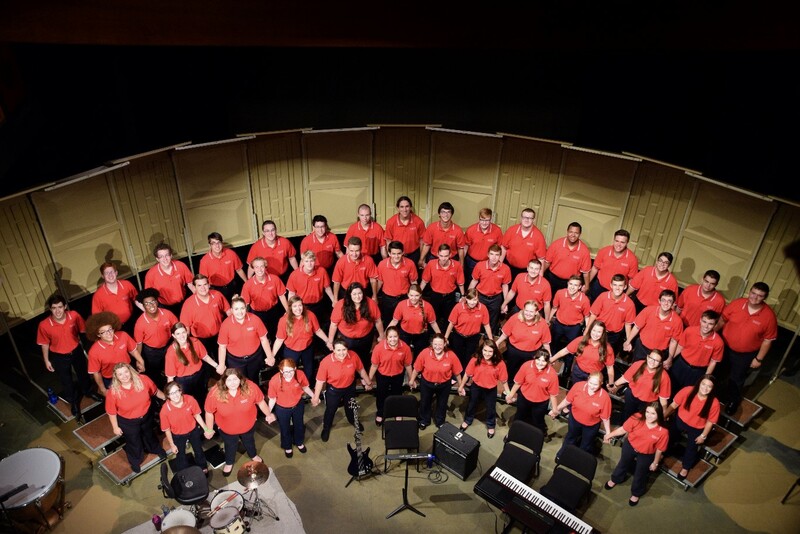 The inclusion of college-age singers allows both for the opportunity to pursue greater musicianship and for high school singers to get firsthand perspectives on collegiate musical experiences and programs. Singers do not have to be Ohio residents to apply. What is the time commitment for the Cardinal Chorale? In addition to the week at Muskingum, there are a few performances throughout the year. These typically include a post-Christmas December concert in Pickerington, a Winter Pops concert in Coshocton President’s Day weekend, and a week-long tour in June. The tuition for the Cardinal Chorale Music Workshop includes the singers room/meals, uniform, music, and more. The volunteer staff helps make the experience as affordable as possible. The cost of the 2018 Workshop was $495. What fun evening activities are there? We believe that fun team-building and other group activities are essential to a healthy and musically successful choir, so there are opportunities for games, sports, and other non-musical activities. Muskingum University is a wonderful site for these purposes, and has beautiful performance spaces where we will host evening performances by guest musicians. All activities are supervised by our effective and responsible staff, so parents can be sure that their singers are safe while they are having fun! We will eat most meals in one of the dining halls at Muskingum University, housed in the same residence hall as our bedrooms. This will allow singers to have a few choices from meal to meal, and will give us time to sit and eat together as we make new friends. Eating in the dining halls will also provide an important part of the Muskingum experience that we are so excited to share with our singers. Singers will live in air-conditioned, double-occupancy rooms in one of Muskingum’s residence halls. Each single-gendered floor will house singers and staff. How can I apply for the Cardinal Chorale this year? It’s easy! Fill out the online application form. After we have received this initial application, you will be contacted about the simple audition process. Please visit our application page here. I don’t read music, can I still apply? While the ability to read music will certainly help, there are part, sectional, and full rehearsals each day that will help you learn your part. What do I need to do to prepare to go? We will send you a CD with recordings of most of the songs before you arrive. Spending time listening to the recordings before you get to Muskingum will help you (and the ensemble) be successful during the Workshop.